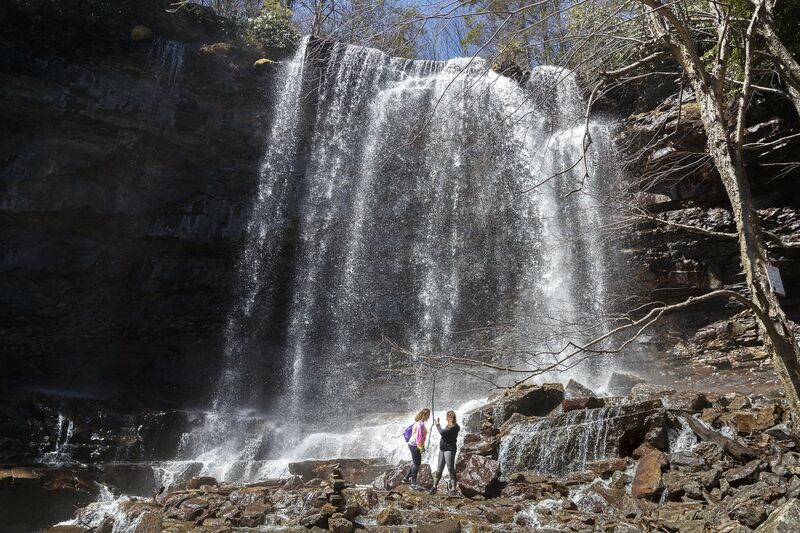 Two hikers stop to capture the grandeur of the middle falls on the Glen Onoko Falls Trail. The Pennsylvania Game Commission is closing the main trail in Jim Thorpe on May 1. JIM THORPE, Pa. — “Don’t take another step!” they yelled in unison. But the toddler, a nature lover like his dad, did step onto the slimy rocks atop the waterfall that summer afternoon in 1983, and screams filled the gorge along the Glen Onoko Falls trail. An uncle jumped toward the child, and went over the edge, dying on the rocks 60 feet below, but not before pushing the 3-year-old back toward his parents. Thomas Russell also leaped out to his son, Ian. This unbearable, half-second memory has been seared into his mind for 35 years now. If Russell, now 68, wanted to dynamite Glen Onoko Falls, to tear up the roads that lead there, and seal all its beauty off from the world, you would understand why. But he blames only himself, not nature, for the deaths of his son and brother-in-law, and he disagrees with a recent Pennsylvania Game Commission decision to close the rugged, popular trail by May 1. Nearly a dozen fatalities have been reported there over the last half-century, along with numerous injuries. A hiker on the Glen Onoko Falls trail helps his companion up to the rocks near the lower falls to get a closer look. A Game Commission spokesperson did not return repeated requests for comment this week, but WFMZ 69 reported that the agency cited erosion and overuse as additional factors in its decision. The news had a backlash online, with 8,500 people signing a petition to keep the trail open. Dozens of hikers on Tuesday morning felt a curtain was closing on this scenic trail 85 miles north of Philadelphia in Carbon County. “I read about it on Facebook, and I figured we have to get here one last time,” said Gary Meinhardt, 41, of Levittown. The popular website AllTrails.com lists Glen Onoko Falls as a difficult hike where proper shoes are required. The trail is a 3.7-mile loop and ascends easily, with flat terrain, for about a quarter-mile beyond the parking lot, following Glen Onoko Run closely. But it grows steeper and rockier as it goes upward, with some narrow ledges that do appear to be eroding and some steep drop-offs. Often, hikers need to scramble over wet rocks. “I’m a beginner hiker and I thought this was a challenging trail. That said, it was 100% worth it,” one reviewer wrote on the website. Signs along the trail, not far from where Ian Russell and his uncle, David Carylon, 22, fell to their deaths are even more ominous. “People have been killed or seriously hurt in this area!” warns one posting, with a skull and crossbones etched into it. When a man was killed and his friend injured there in 2016, the Allentown Morning Call reported that 11 people had died at Lehigh Gorge State Park over recent decades, most of them at Glen Onoko. But Mark Nalesnik, Carbon County Emergency Management Agency director, said even minor injuries such as sprained ankles can put a toll on first responders. Because of the terrain, he noted, it can take hours to bring someone down to the parking area safely. He said he believes hikers will still go there, regardless of whether the trail is officially closed. “If that’s what it is, we’re going to deal with it,” he said. Nalesnik said the most serious problems are caused by improper footwear and bad decisions, two factors evident Tuesday afternoon. While most hikers had ankle-high boots, one woman hiking with children wore clogs, and a man in sneakers inched his way out, beyond a small chain and warning signs, to the very spot where Ian Russell fell decades ago with his uncle. Ray Balsavage, 44, and Paul Herzog, 43, both of South Philly, decided to stay on a lower portion of the trail with their children, a handful of toddlers who were bounding around on the rocks by smaller falls. "We decided early that this is the highest we’re going to go, and even that is making me nervous, " Balsavage said. Joe Neville, executive director of the Keystone Trails Association, said the Glen Onoko Falls trail might be among the top five most popular trails in the state. He believes the Game Commission, with its focus on wildlife and hunting, should work out an agreement with the state’s Department of Conservation and Natural Resources, an agency more accustomed to maintaining hiking trails and educating the public. The online petition suggested transferring the trail, which is on game lands, to Lehigh Gorge State Park. “The Game Commission is set up to educate the people about hunter education, about firearms and hunting issues,” Neville said. A DCNR spokesperson could not be reached for comment Tuesday. Neville said he also believes people will continue to hike the trail, and its closure will require the Game Commission to assign even more personnel to patrol it. Russell, who lived in North Wales, Montgomery County, at the time of the tragedy, has since moved to Carbon County. He’s been back to the Glen Onoko Falls trail only a few times, “trying to find a little peace.” He had carried his son’s body down the trail, handing him off to first responders, then etched a small mark in a tree to remember. “He was just a curious little boy,” Russell said, through tears. “It was an accident. Just sad." Russell urged anyone who hikes at Glen Onoko Falls to respect its power, whether open or closed.